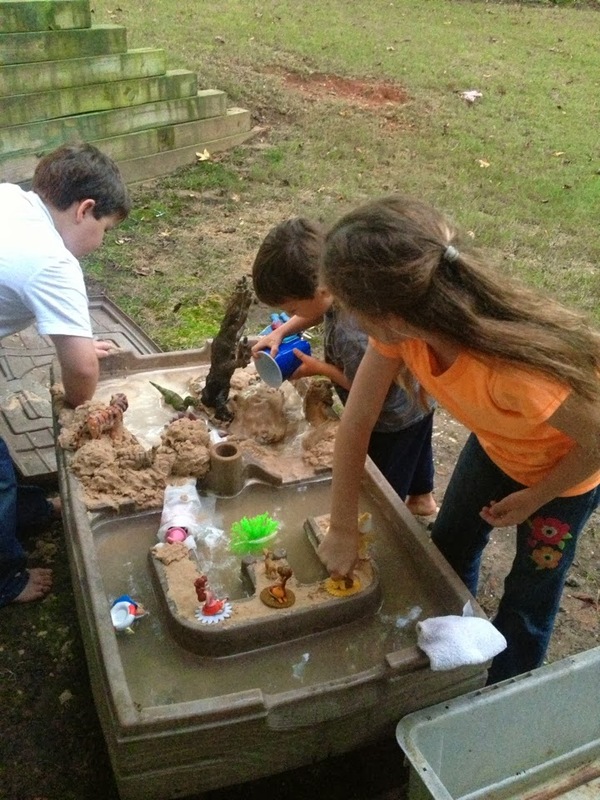 Homeschooling 3: Weekly Highlights ~ Fall is Here! Baking, Favorite Board Games, a Fair, and a Snake! Weekly Highlights ~ Fall is Here! Baking, Favorite Board Games, a Fair, and a Snake! Beautiful. That's the best word to describe our first day of fall in the south. The kids played for hours in the water/sand table we got for Caraline on her third birthday. And, beautiful is a great way to describe our church service that Sunday. The sermon topic was "Faith of Steel." Seeing faith in action is always beautiful. We made brownies, cookies, and a cream cheese with white chocolate (yum) based icing from scratch, which was even better served cold the next day as a dipping for grapes! Fall just begs for baking! Ryan's cute cookie on the left and Jonathan's "dinosaur" on the right. 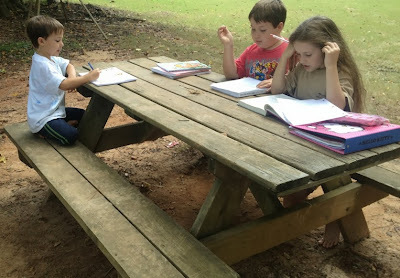 The weather has been fabulous and we've finally been able to do more book work at the picnic table. Notice how nicely Jonathan (far left) is sitting. Only after threatening him with a trip to our principle (Daddy) did he sit nicely and finish his work. Sometimes it's so hard for him to give up five minutes of searching the backyard for critters to actually work on his handwriting. Life can be so unfair. We've also had a lot of fun playing a with a new chess set from Chess House (review coming soon!) and an old family favorite this week, Sum Swamp . Daddy taught Caraline to play Chess this past summer. I'd never played chess until recently, too. I was so thankful that a how to DVD with tips came along with the Chess set we are reviewing. I'm actually doing pretty well now. The boys are picking up fast, too! Here Caraline is supervising as the boys play a game. Sum Swamp has been a favorite for years. It's a fun addition and subtraction game. Even Daddy enjoys playing this simple game with the family. Basically, there are 3 die, two with numbers 0-6 and one with + or - on all sides. How many squares you move is based on the answer to your addition or subtraction problem. 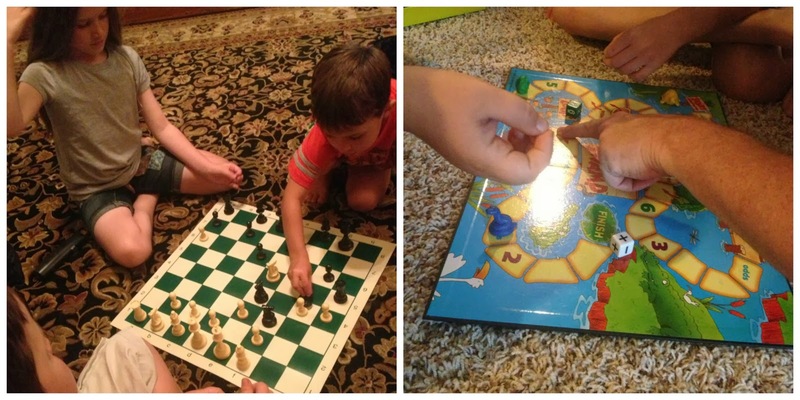 The swamp themed game board and swamp creatures (snake, toad, turtle and snail) make this a hit with the kids. We spent our weekend with my husband's family. They live about four hours away. On the drive up, Caraline spent most of her time practicing crocheting. 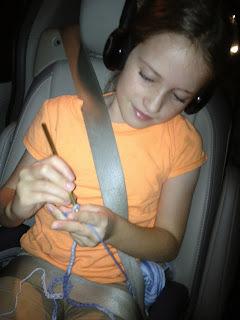 Her co-op teacher gave all of the students yarn and a hook for practicing at home. She is loving her class! She's my crafty girl! There was also a craft show and fair in town. 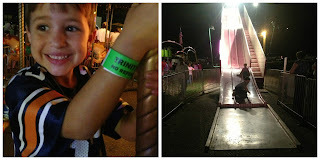 The kids and I went with my mother-in-law, niece and cousin to the fair! Jonathan rode three rides over and over and over and well, you get the picture! 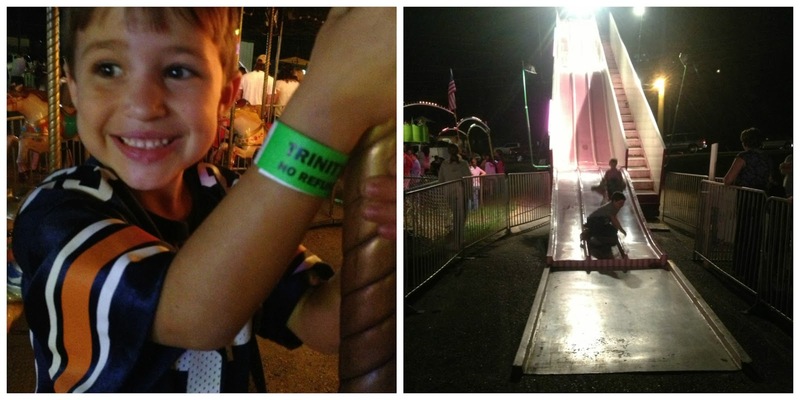 His favorites were the carousel, the big slide and the jumpy house. Caraline and Ryan rode a little bit of everything that night. A pretty spider's web Jonathan noticed on our way to the pond. Saturday was another beautiful day. Jonathan and I decided to go for a morning stroll to one of the ponds behind the grandparents' house. If we go to the pond alone, I make sure that all five dogs (3 belonging to the grandparents and two that belong to my niece and nephew - they live across the street) accompany us on the quarter of a mile or so path to the pond. I've never seen a live snake in the fifteen years I've been visiting my in-laws, but I've always felt a little safer knowing the dogs were with us. My first year there I did see Buster Dog kill a water moccasin. Caraline helped PaPaw make his yummy chicken casserole for Sunday lunch. She was so proud (and PaPaw, too) to have done everything except cut up the chicken. Jonathan found lots of toads. Ryan learned to serve a volleyball - very well. We all played a game of volleyball. That was fun! The kids played many games of volleyball. We ate lots of yummy homegrown muscadines. Aunt W. gave Caraline a sewing machine!! ~ Caraline has been wanting one for years and now she's finally at an age to be able to really use one. And we spent great quality time together. Even though four out of five of us were miserable with the sniffles, it was a wonderful weekend! 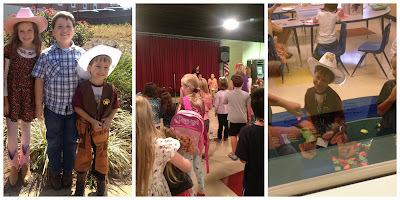 This week I am linking with our friends at Homegrown Learners for Collage Friday and Weird UnSocialized Homeschoolers' Weekly Wrap-Up. It looks like a fun week. 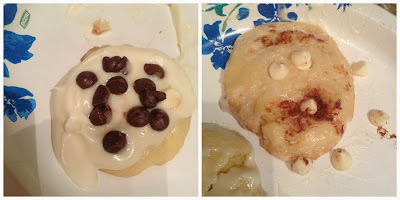 I agree fall is time for baking. Your weekend' with Marty's parents sounds nice, Hope -- your children are so blessed with so many rich family connections!! Western Day looks like fun, too! I'm thankful for you linking each week, my friend! Oh snakes! Yikes! That is my greatest fear, along with sharks. We were in Florida this week and I was a crazed lunatic standing on the edge of the water watching for dark shadows in the water while my kids boogie boarded. I get your fear. Totally get it! I am so proud you all had so much fun in everything you did and everything you do. You all have an exciting, interesting life while you are also able to homeschool at the same time...I know Sheila and Joe Mack enjoyed you guys as much as you enjoyed them. :) I know you must to have gotten your fear of snakes from me... :) Sorry the dogs let you down on that one... I love you all and can't wait to see you in a couple of weeks.